We've handpicked an exclusive selection of châteaux, manor houses and luxury villas in South West France to discover the many pleasures of this beautifully unspoilt region. With the famous Bordeaux wine region immediately to the north west, wine lovers can stay in the typically French Château Marcoux and visit prestigious vineyards for tours and tastings, or even sample the red wine from the owner's own vineyard at Le Moulin de St Sulpice. Just as renowned as the wines of Bordeaux is the gastronomy of the Périgord regions of the Dordogne, from Confit de Canard to indulgent Foie Gras on offer in medieval market towns and acclaimed restaurants. Le Bournaguet is very close to medieval Sarlat, which has an outstanding market and is like walking through a film and especially atmospheric at night. 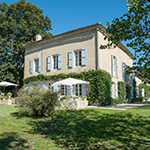 All our luxury French properties have fabulous kitchens for preparing a gourmet feast, or the option to hire a chef, and splendid settings for indoor or outdoor dining. Unquestionably, the idyllic scenery of South West France is a major highlight, from wooded river gorges to hilltops graced by fairytale bastide villages and the majestic peaks of the Pyrénées, which provide the backdrop for the elegant French manor house, La Bourdette. Our luxury French villas, manor houses and châteaux are set in acres of landscaped grounds but also enjoy breathtaking views of the stunning surrounding countryside. Our 9 properties in the South West are located in particularly beautiful and tranquil parts of the Lot-et-Garonne, the Lot, the Gers, the Dordogne, the Ariège-Pyrénées and the Pyrénées-Atlantiques. Magnificent and stylish Manor House in the Ariège-Pyrénées, set in extensive grounds with a large pool, fabulous pool house and tennis court. Splendid hill top farmhouse, set in extensive panoramic grounds with a tennis court, in the heart of the Dordogne countryside. Château-style Manor House in the beautiful Lot-et-Garonne, which is ideal for family and friends and includes a fantastic pool house. 18th century Manor House with a self-contained studio suite and beautiful views over the Lot-et Garonne countryside. The 18th Century “Château de Gaujac” is set in 20 acres to the west of Toulouse, in the beautiful, unspoilt Gers. Luxurious Manor House, Annexe and ‘Pigeonnier’, transformed from a 12th century fortress, in 20 acres of grounds, in the Lot-et-Garonne countryside. 13th century water mill on the banks of the Célé River in the Lot, which provides charming accommodation in the Millers House, Tower and Cottage. It also has a tennis court. Beautifully renovated farmhouse in the idyllic Dordogne countryside, set in lovingly tended gardens with a full size pool and dining pool house.